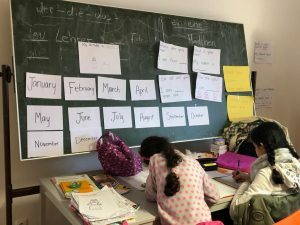 This week, after a break for the Christmas and New Year’s celebrations, we resumed our English Tutoring & Homework Support for the refugee children living in the camp in Hanau, Germany. Despite of the break, the numbers continue to grow, we have been having around 20 children coming each day. This week they learned their months and refreshed their numbers. A good number of refugee parents have been passing by the classroom to introduce themselves, which is quite interesting; a great sign of appreciation to our volunteers. This project got a very good traction in very little time. However, few days ago we had a set back. The camp management told us we cannot use the room inside the camp anymore on Tuesdays and Thursdays from February. 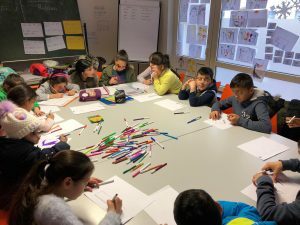 That is because the city of Hanau wants to use the room for German classes. We are still talking to them to find an alternative time or maybe even an alternative location nearby the camp, so that we can continue to support these lovely group of refugee kids!